140Klm you should see a mechanic about possible problems or non-standard restrictions in place. bike to the table below for the most likely restrictor combination. Top speed of around 110Klm? 0-60 about 11 seconds? Most likely a stock bike, restrictors in the exhaust, intake housing, and a smaller front sprocket. Top speed of around 240Klm? 0-60 about 6 seconds? Most likely a de-restricted bike, including a proper size front sprocket. have no problem doing the work. 1) Remove the lower fairings from both sides of the bike with a crosshead screwdriver. lever. Take the nuts off the bolds but leave the bolts in place for now. You need a 12mm socket for this. 3) Undo the two nuts holding the exhaust manifold to the head with a 12mm socket and take them off. 4) Taking care to support the exhaust remove the two bolts you loosened earlier and pull the whole system off the bike. off before you can see these welds. you followed to take it off. so it doesn't matter if you damage it. come through the other side of the plate. 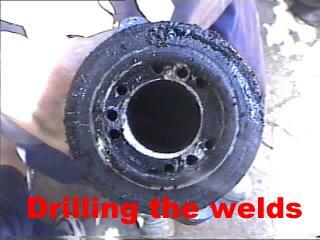 Remember to drill vertically down to avoid damaging the actual exhaust. 9) Now get another drill bit, about 8mm, and use that to enlarge each one of your holes. 10) Repeat using larger and larger bits until you have drilled out most of the metal making up each weld. that you have filed the remainder of the welds flat. It will come out, you just have to make sure it does not catch on anything. you took to get it off. nut and bolt holding the tank to the frame and lift the tank off. 2) Undo the two bolts holding the airbox in place to the frame and use a screwdriver to undo the cir-clip (figure 1) holding the airbox to the carb. Pull the petrol runoff hose off the airbox and pull the airbox off the carb. The airbox should now pull out completely. 3) Undo the bolt holding the plastic tray on which the servo motor is housed to the frame, do this by taking out the bolt (figure 2) and uncliping the plastic clip (figure 3) now pivot the tray towards the headstock giving you room to work on the carb. 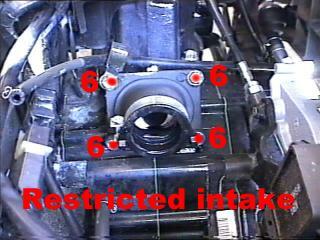 4) Remove the small hose (figure 4) attached to the left side of the carb (facing the way the bike is facing) and undo the circlip holding the carb onto the intake rubber (figure 5). There are two hoses coming out of the top of the carb which lead to nowhere, leave these and the float bowl spill hose on the bottom attached, now pull the carb away and leave it dangling to one side. 5) Undo the 4 bolts (figure 6) holding the intake rubber to the engine and take off the whole lot to reveal the intake tract. 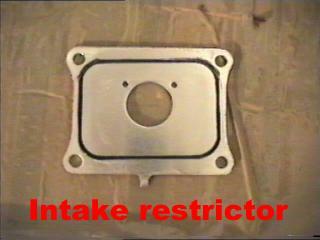 If there is a gold intake restrictor attached to this get rid of it. This is the restrictor plate and you can clearly see that it stops some of the fuel flow into the crankcase. by now. Now re-assemble everything reversing the steps you followed to take it apart. for the bike to start running properly, after about 5 minutes it should be back to normal. 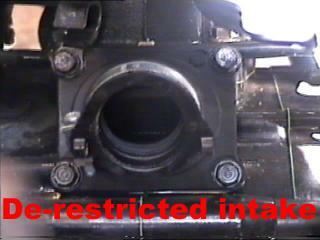 An engine "port" is an open window in the cylinder wall for the intake or exhaust of fuel mixture (air/gas). There is one or more forward-located exhaust ports, two or more side transfer ports, and one rear intake port. The intake and transfer ports allow fuel mixture to enter the cylinder, and the exhaust port allows the burnt fuel mixture to exit the cylinder into the exhaust pipe. The higher the top edge of the exhaust port is in the cylinder, the higher the powerband is. That is to say that the "band of power" will be higher in rpm's (rotations per minute). That's because when the expelled exhaust reaches the rear cone of the exhaust pipe some of it bounces back as a pressure wave that, when it reaches the cylinder, can keep the newly entered charge of fuel mixture from wastefully exiting from the cylinder into the exhaust pipe. The time it takes for the returning pressure wave to reach the cylinder is usually around .003 seconds, but the time from the exhausts first entrance into the pipe till the new fuel mixture tries to escape thru the exhaust port (due to the upward piston movement trying to compress the mixture there) is dependent on the engine rpm. At high rpm's, that time period is short, and at low rpm's it is long. The rpm range centered around when the two time periods coincide is the range of the powerband, or peak efficiency of the engine, when there is little or no loss of fuel mixture out thru the exhaust port. So when the exhaust port is high in the cylinder, the pressure wave cycle begins at an earlier degree of crank movement (starting from the pistons topmost position), let's say at 80 degrees past TDC (top dead center). The new fuel charge will have completely entered the cylinder at around 180 degrees, when the piston is at its lowest position and the crank is halfway thru its 360 degree cycle. At around 230 degrees the piston seals off the intake ports from the combustion chamber (the area between the piston top and the cylinder head) and starts trying to compress the fuel mixture and some will exit the exhaust port unless the pressure wave blocks it. If the pressure wave comes back sooner or later than when the piston has halfway closed off the exhaust port (say around 260 degrees) then some of the fuel mixture will escape out the exhaust. A typical pressure wave return time is .003 seconds. With the exhaust port beginning to open at 80 degrees, this wave would return exactly when needed at 10,000 rpm because then the time it takes for the piston to move from 80 degrees to 260 degrees is .003 seconds. If the exhaust port was lowered to open at 100 degrees then the center of the powerband would lower to around 9,000. This is essentially what a power valve in the exhaust port does to broaden the powerband by 1000 rpm. A power valve is just a piece of metal that blocks or unblocks a higher section of the exhaust port according to the engine rpm. At low rpm's it blocks that upper section of the exhaust port until the upper target rpm is reached when it will move to unblock that area. This essentially changes the exhaust port timing. Looking at the graph, you can see the difference in the powerband between an continually opened power valve (A) and a continually closed valve (B). So if the valve opens fully at X rpm's then the resultant powerband can be represented in the second graph. Ideally, the transfer/intake ports should also have upper area valves, but that is a technological hurdle that hasn't been accomplished yet. These ports upper edges also should be higher for a high rpm powerband, and lower for a mid rpm powerband. A powerbands rpm range is determined primarily by the port heights, and secondarily by the design of the exhaust pipe. There are pipes for top rpm powerbands, and ones for mid rpm powerbands. The pipe should match the type of powerband that the engine porting is designed for. A high rpm pipe can be changed to a mid rpm pipe by lengthening or widening the fat part of it so that the length and area till the rear cone is increased which means it will take longer for the exhaust wave to reach that rear cone, and longer for the wave to return to the cylinder. An engine that was designed for trails riding can have its ports top edges raised more with a grinding tool for more of a top end powerband for motocross use. And a motocross engine can have its powerband lowered by lowering the cylinder (and therefore the ports) with a thinner base gasket or by machining 1 or 2 millimeters off the base of the cylinder (where it rests on the base gasket) and machining the same amount off of the cylinder head's squish band (which also makes it wider which is better for mid-rpm engines). Without machining the cylinder head there would be too much of an increase in the compression ratio. The ideal head to piston clearance is 1 - 2 millimeters (2mm for >250cc engines) which is what you need after all machining is done. The clearance can be measured with the help of some plumbers solder before and after the machining work. Just put a length of it across the top of the piston (left to right) after taking off the cylinder head. Then put the head back on with the correct torque and slowly kick over the engine with the spark plug cap off of the spark plug. Then remove the head again and remove the solder in order to measure its "squished" thickness. Measure the thinnest part with a micrometer. It should be equal or slightly more than what it was before the machining work was done. Also you should double check the compression with the cylinder head on. An 80 - 200cc engine should have 150-190 psi, while a 250cc engine should have 170-230 psi. Too much compression should be reduced by using a thicker head gasket or by lathing off more metal from the squish band of the cylinder head. Porting a cylinder is no easy task. You should have a good idea as to what you are doing, and what you are hoping to achieve. It only takes a second to completely ruin a good cylinder. I always suggest that for your first couple of attempts (as it is almost inevitable that you ARE going to mess-up the first time!) be done on a junk cylinder that you would never try to use anyway. If you ruin the port-job, no big deal, you weren’t going to use it anyway, but IF you happen to get it right the very first time, then you have a pattern to go by. It’s not all about “opening-up” the ports. Again, a lot of it has to do with improving the “flow characteristics”. This is why port timing and port shape are more important than port size in a lot of respects. If you go in and just grind-out the ports, opening them to the max, the engine will be even weaker than it was to begin with. My very first successful porting job was achieved because I actually took over a week just studying the piston and cylinder, and the “flow” through the engine. I used a sharpie marker to make reference marks, measured the port windows, the port timing, etc. It took me over a week just to feel confident enough that I REALLY understood what was going on with just these two parts, the piston and the cylinder. Then I studied the piston and cylinder, along with the intake manifold and header pipe. It was at this point that I realized that the “holes” don’t normally line-up perfectly from the factory, thus disrupting the “flow characteristics” of what I was attempting to achieve. So, I also, again with a marker, made reference marks to “match” the intake hole of the cylinder, with the mating hole of the intake manifold, and the same with the exhaust flange. This is probably one of the most important things that can be done to improve performance is to make sure that all of the ports match what they are connected to. By this I mean intake port to intake manifold, transfer ports to engine case, and exhaust port to exhaust header flange. Having the appropriate gasket, and a marker is the best way to “match the ports” to one another. Use the gasket as a template, line-up the bolt holes with the holes in the gasket, and use a marker to trace the inside of the gasket hole around the port. Remove the gasket, and then you have a guide to go by in order to get the port-holes to line up. Grind / file carefully, just to your mark, be careful not to grind past your mark. You will need to repeat this process for the intake, exhaust, and transfer ports. Do the same thing to the actual intake manifold, the exhaust header-pipe flange, and the engine crankcase provided that you have completely disassembled the crankcase, and removed the crankshaft, bearings, and seals. You do NOT want to get ANY grindings or metal shavings inside of the engine!!! The following process needs to be performed with the utmost care and particular attention to detail. One of the first things to check and keep in mind is the depth of the bolt holes, as you do NOT want to open the port so much that you expose the bolt hole passage inside of the intake or exhaust ports. Not only would this disturb the “flow” that you are working to achieve, but it also creates the likelihood of an air-leak past the bolt threads. So, trace the bolt hole path, and depth, and make sure that you do NOT get too close to this limit! Cleaning-up the rough edges of the port windows inside of the cylinder bore is really all you need to do to the port windows, as ANYTHING further, and you’re messing with the port timing (keep in mind, we’re out to build a little two-stroke screamer, NOT make a boat anchor out of your cylinder!). Reshaping the port mostly consists of “ramping” the port walls to the port-matching that you have accomplished up to this point. If you have a round intake port, then you need to make it as “round” as possible. If you have a rectangle-shaped intake port, you want the intake manifold and the intake port to match each other. Also, sharp corners are not good for efficient flow. The corners need to be rounded, but remain “matched”. The exhaust port outlet usually needs to be as round as possible, to match the header flange. For better atomization of the fuel mixture, intake and transfer ports need to be “roughened”. This aids in breaking-up fuel bubbles, and ideally will turn wet fuel into a vapor, as the more atomized the fuel mixture is, the better combustion will be, and the better the fuel mixture will expand. The exhaust port on the other hand, needs to be as smooth and slick as possible. The smoother the exhaust port is, the more freely the spent fuel mixture is dispersed, and the quicker the exhaust is expelled from the cylinder. This will aid in the “scavenging” in the combustion chamber, and will actually help to pull more fresh fuel mixture into the cylinder faster. Another benefit to a smooth exhaust port is that carbon won’t build-up in the exhaust port as quickly as it will when there is roughness for unspent oil to catch in, and bake and burn into carbon. After you are finished with all of the port work, ALL PARTS MUST BE THOROUGHLY CLEANED!! !